Parker Bridwell pitched six shutout innings and Kole Calhoun hit a home run as the Angels got by the Twins 2-1 on Wednesday night at Target Field. Bridwell gave up just four hits during his 98-pitch performance, improving his record to 3-1 on the season. He struck out five and walked three. Calhoun gave the Angels a 1-0 lead in the 1st inning with a solo blast, it was his 12th of the season, coming off of former Angel Ervin Santana. It would stay that way until the 6th inning, when Cameron Maybin stole home on a successful double steal attempt, with Calhoun taking 2nd. The Twins would get on the board in the 7th after an RBI single by Brian Dozier. However, that’s as close as they would get. Bud Norris pitched a perfect 9th inning to record his 12th save of the season. David Hernandez and Cam Bedrosian each pitched scoreless innings of relief as well. “Parker pitched with his back against the wall the whole game, all our guys did,” Scioscia added. Santana (10-6) took the loss. He pitched a complete game, giving up the two earned runs on seven hits. He struck out five and walked two, while throwing 117 pitches. Albert Pujols collected his 2,900th career hit in the first inning, becoming the 40th player in major league history to reach that mark. Ricky Nolasco (4-9, 4.42 ERA) will start in Texas on Friday against Rangers LHP Cole Hamels (3-0, 4.12). The Halos will finish up the 1st half of the season with a 3-game set against the Rangers. This entry was posted in Angels on July 5, 2017 by omzzzzz. Clayton Kershaw struck out 12 batters and Joc Pederson hit a three-run home run as the Dodgers defeated the Angels 6-2 on Thursday night at the Big A. The victory salvaged a split of the four-game series between the cross-town rivals. Kershaw became the first 12-game winner in the majors this season, improving his record to 12-2. He gave up just one unearned run over seven innings. 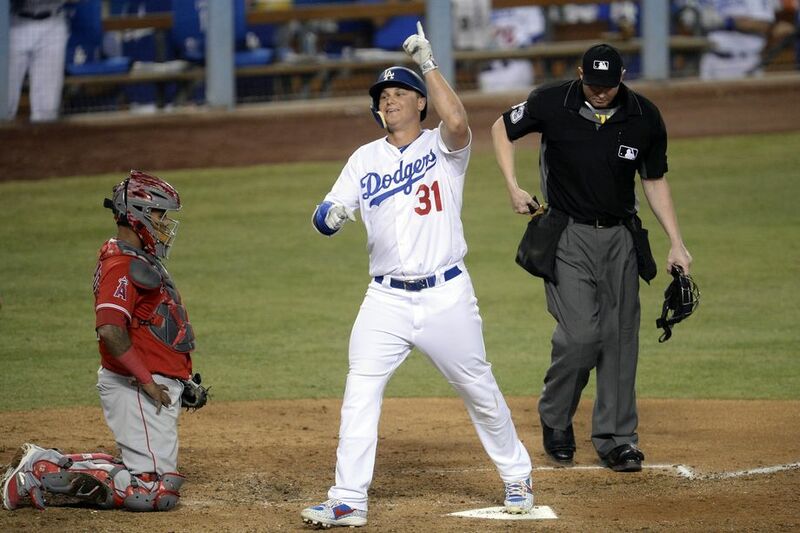 The Dodgers also got solo home runs from Yasiel Puig and Chase Utley in the fifth inning. Pederson’s sixth-inning home run came off of J.C. Ramirez (7-6), who took the loss. The Dodgers have hit 50 home runs in the month of June. That breaks the franchise record for home runs in a month, which was set in 1953. Both teams exchanged runs early on. Utley delivered a sacrifice fly in the 3rd inning, scoring Logan Forsythe. Albert Pujols reached on a fielder’s choice to shortstop, which allowed Cameron Maybin to score in the 4th. Kole Calhoun came up with an RBI single in the 8th inning off of Luis Avilan, which was all the scoring for the Halos. Kenley Jansen recorded the final four outs for his 18th save of the season, but their was drama in the 8th inning. Brandon Morrow hit Yunel Escobar with a fastball in the shoulder, which resulted in both benches and bullpens clearing. No fights occurred, but Escobar was furious with Morrow, who was his former teammate in Toronto. That also loaded the bases for the Angels with one out. Morrow then struck out Luis Valbuena, then Jansen came in to retire Martin Maldonado, who flied out to center. The Dodgers improved their record to 53-28 and have taken a 2.5 game lead over Arizona in the NL West. The D’Backs will be visiting Dodger Stadium next week. The Angels are 42-41 and one game out of the last AL Wild Card spot. The Dodgers now travel to San Diego to take on the Padres for a 3-game weekend series. Alex Wood(8-0, 1.86 ERA) goes for the Dodgers on Friday. Clayton Richard (5-7, 4.42 ERA) is on the mound for the Padres. Meanwhile, the Angels will host the Mariners for a three-game set at the Big A. Parker Bridwell (2-0, 2.95 ERA) gets the ball for the Halos. Sam Gaviglio (3-2, 3.38 ERA) goes for the Mariners. This entry was posted in Angels, Dodgers on June 29, 2017 by omzzzzz. Ben Revere scored the game-winning run in the bottom of the 9th inning after a throwing error by Yasmani Grandal, and the Angels got by the Dodgers 3-2 on Wednesday night at the Big A. With one out in the 9th, Revere reached on an error by second baseman Chris Taylor. He would advance to second base on a wild pitch by Pedro Baez (2-1). Moments later, Cameron Maybin struck out swinging, but the ball got past Grandal, who raced to pick it up to try and throw out Maybin at 1st base. However, Grandal’s throw sailed over the head of 1st baseman Chase Utley’s head, and into right field. That allowed Revere to come home from second base for the walk-off game winner. In the Dodger half of the 9th inning, it looked like Grandal was going to be one of the game’s hero. He drilled a solo home run to center field that tied the game 2-2, off of Cam Bedrosian. Bedrosian (2-0) got credit for the win. The Boys in Blue were trailing 2-1 in the 8th inning when Trayce Thompson hit his first home run of the season, a solo blast off of Keynan Middleton, which put the Dodgers on the board. The Halos took a 2-0 lead on a two-run homer by Andrelton Simmons in the 6th inning, coming with Kole Calhoun aboard. Those were the only two runs of the game given up by Hyun-Jin Ryu. He pitched 5 2/3 innings, scattering two runs on seven hits, while striking out eight and walking one. Alex Meyer pitched even better for the Angels. He threw six shutout innings, yielding just one hit, striking out four, while walking five. The series finale goes down on Thursday night at the Big A. Clayton Kershaw (11-2, 2.47 ERA) will try to help the Dodgers salvage a split of their four-game set. JC Ramirez (7-5, 4.38 ERA) will get the ball for the Halos. This entry was posted in Angels, Dodgers on June 28, 2017 by omzzzzz. 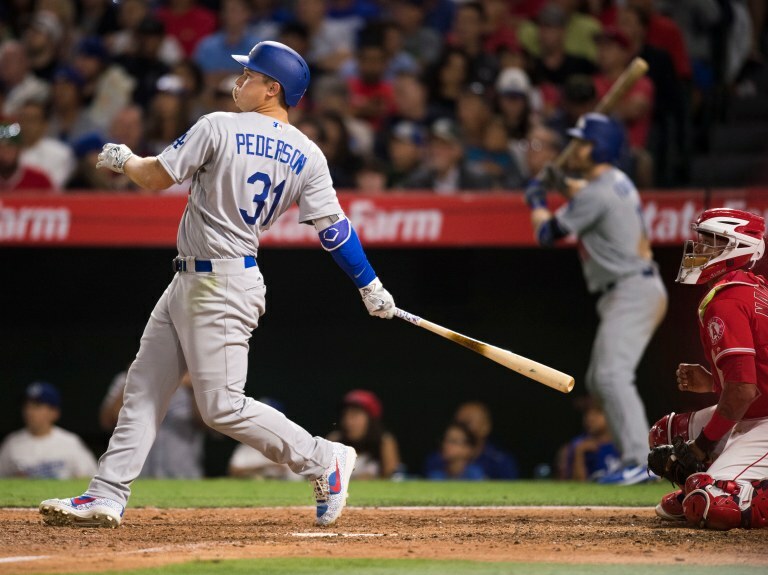 Joc Pederson hit a three-run homer and Kenta Maeda threw a career-high seven shutout innings, as the Dodgers shutout the Angels 4-0 on Tuesday night at the Ravine. Maeda gave up just four hits, struck out six batters, and did not walk anybody. He improved his record to 6-3 on the season. All four Dodger runs came in the 6th inning. Chase Utley lead off with a double against Jesse Chavez, then Logan Forsythe walked. After Chris Taylor flied out to center, Utley tagged up and moved to third base. That prompted Angels’ skipper Mike Scioscia to bring in reliever Jose Alvarez to face rookie-sensation Cody Bellinger. Bellinger then drilled a 1-0 pitch to left center for an RBI single, which scored Utley. Austin Barnes was up next, and his ground out to first moved Forsythe to third and Bellinger to second. That set the stage for Pederson, who ripped an 0-1 pitch over the center field wall for his 7th home run of the season. That gave the Dodgers a 4-0 lead, and was the only offense either team would produce on the night. Since returning from the DL on June 13, Pederson is hitting .319 with five home runs. Brandon Morrow pitched the final two innings for the Dodgers. He gave up only one hit while making an efficient 16 pitches. Jesse Chavez (5-8) took the loss but pitched well. He pitched 5 1/3 innings, and was charged with 2 runs while giving up just two hits. He struck out five and walked four. Both teams rested a number of everyday players. The Angels rested Albert Pujols and Cameron Maybin. The Dodgers sat Yasmani Grandal, Corey Seager, Yasiel Puig, and Justin Turner. Game 3 of the series shifts to the Big A on Wednesday night. Hyun-Jin Ryu (3-6, 4.30 ERA) gets the ball for the Boys in Blue. The Halos will counter with Alex Meyer (3-4, 4.20 ERA). This entry was posted in Angels, Dodgers on June 27, 2017 by omzzzzz. Yunel Escobar drove in a two runs and Ricky Nolasco pitched into the 7th inning, as the Angels surprised the Dodgers 4-0 on Monday night at the Ravine. The Halos snapped the Dodgers 10-game win streak. Nolasco went 6 2/3 innings, and picked up his first win in two months, improving to 3-9 on the season. The former Dodger gave up five hits, struck out five, and walked two. He left the game after getting hit with a line drive off the bat of Enrique Hernandez. Cam Bedrosian, Keynan Middleton, and David Hernandez continued the shutout over the final two plus innings. Escobar delivered a two-run single in the 3rd inning off of Rich Hill, which scored Cameron Mabyin and Kole Calhoun. Danny Espinosa added a sacrifice fly in the 4th inning that scored Andrelton Simmons. Martin Maldonado capped the scoring with a solo home run off of Sergio Romo in the 9th. Hill went seven innings, giving up three runs on four hits. His record dropped to 4-4 on the season. He struck out seven and walked two after making 99 pitches. The shutout also meant that the Dodgers ended a streak of 17 consecutive games with at least one home run. That tied the longest stretch since the team moved to Los Angels prior to the 1958 season. The Angels won for the fourth time in the last five games, and moved two games over .500 at 41-39. Game 2 of the series goes down tomorrow night at the Ravine. Kenta Maeda (5-3, 4.62 ERA) gets the ball for the Boys in Blue. Jesse Chavez (5-7, 5.15 ERA) takes the mound for the Halos. This entry was posted in Angels, Dodgers on June 26, 2017 by omzzzzz. 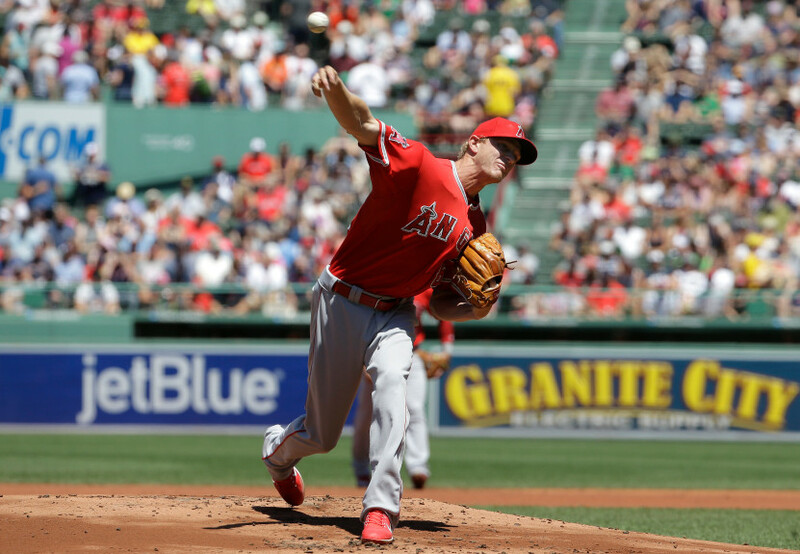 Parker Bridwell pitched a strong 6 2/3 innings and the Angels scored three big runs after an overturned call to beat the Red Sox 4-2 on Sunday afternoon at Fenway Park. In the 2nd inning, the Angels challenged the ruling on Danny Espinosa’s 3-6-3 double play. The call was overturned, and Espinosa was safe and credited with an RBI fielder’s choice, giving the Angels a 1-0 lead. Kaleb Cowart followed with an RBI double, which was followed by a run scoring single from Juan Graterol. That gave the Angels a 3-0 lead. Cowart was recalled before the game, while reliever Eduardo Paredes was optioned to Triple-A Salt Lake. Mitch Moreland put the Red Sox on the board in the bottom half of the inning with his 11th homer of the season. Jackie Bradley added another solo shot in the 5th inning to make it 3-2. Bridwell gave up just the two homers among seven hits. He struck out four and did not walk a batter while making 75 pitches. The Halos would add an insurance run in the 9th inning when Cowart delivered an RBI single. Yusmeiro Petit pitched the final two innings to earn his first save of the season. Doug Fister got his first start of the year for the Red Sox. He was released by the Angels earlier in the week. Fister (0-1) took the loss but pitched reasonably well. He went six innings, giving up three runs on seven hits. He struck out six and walked three. The win moved the Angels one game over .500 with a record of 40-39. It also kept them in the thick of the AL Wild Card race. The Angels now begin a four-game series with the Dodgers beginning Monday night at the Ravine. The first two games will be in LA, while the next two will shift down the freeway to the Big A. Game 1 will be Ricky Nolasco (2-9, 5.23 ERA) on the hill for the Halos. He’s lost his last seven decisions. He’ll be opposed by Rich Hill (4-3, 4.73 ERA). This entry was posted in Angels on June 25, 2017 by omzzzzz. JC Ramirez pitched six strong innings for the Halos on Saturday night at Fenway Park, as the Angels knocked off the Red Sox 6-3. Ramirez allowed one run and four hits with five strikeouts. He improved his record to 7-5 on the season. Martin Malonado gave the Angels a 1-0 lead with an RBI single in the 1st, but Mitch Moreland tied the game at 1-1 with a solo homer in the bottom half of the inning. Eric Young Jr. delivered an RBI double in the 4th to give the Angels the lead again. Luis Valbuena contributed a sac fly in the 6th, then Cameron Maybin doubled in Cliff Pennington in the 7th. Maybin would score on Fernando Abad’s balk. Red Sox manager John Farrell was ejected by third-base umpire and crew chief Bill Miller for arguing Abad’s walk. The Red Sox would get a pair of runs in the 9th off of Cam Bedrosian, but it wasn’t enough. Blake Parker came in to record the final out of the game for his 1st save of the season. David Price (2-2) started for the Sox. He gave up three runs (two of them earned) on six hits. He struck out five and walked one while taking the loss. The rubber game of the three-game set will be on Sunday afternoon at Fenway. Parker Bridwell (1-0, 3.07 ERA) gets the start for the Halos. Doug Fister makes his first start of the season for the Sox after getting waived by the Angels. This entry was posted in Angels on June 24, 2017 by omzzzzz. Hanley Ramirez and Sandy Leon each hit two-run homers, as the Red Sox crushed the Angels 9-4 on Friday night at Fenway Park. The Red Sox honored legend David Ortiz before the game, retiring Big Papi’s number 34. It was a rough night for Angel starter Alex Meyer (3-4), who took the loss. Meyer lasted just 3 1/3 innings, giving up five runs on five hits. The Angel bullpen didn’t fare much better. Eduardo Paredes gave up two runs in a little more than two innings of work. Jose Alvarez also gave up two runs. Boston jumped in front 3-0 in the 1st inning, highlighted by a Xander Bogaerts RBI double, Meyer uncorked a pair of wild pitches after that, allowing the Sox two add two more runs. After Ramirez two-run blast in the 4th inning, the Red Sox had built a 5-1 lead. Meyer was critical of his own performance afterward. After Leon made it 7-1, the Angels got three runs back in the 7th. Martin Maldonado sparked the rally with an RBI triple, followed by RBI doubles from Cliff Pennington and Kole Calhoun. That’s all the Halos would though. Leon capped the scoring for the Sox with an RBI double in the 8th inning. That was all Red Sox starter Rick Porcello needed. Porcello (4-9) got the win and pitched 6 1/3 innings. His final line was four runs on eight hits, while striking out eight. The Angels and Red Sox will be back at it on Saturday night at Fenway. JC Ramirez (6-5, 4.59 ERA) goes for the Halos. David Price (2-1, 5.14 ERA) will be on the mound for Boston. This entry was posted in Angels on June 23, 2017 by omzzzzz. 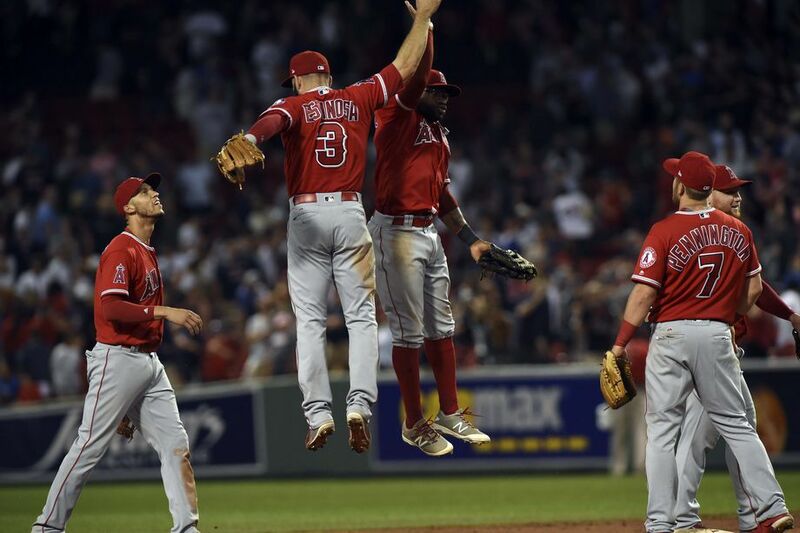 The Angels rallied for four runs in the 7th inning on Thursday night, defeating the Yankees 10-5 at Yankee Stadium. The Halos took two out of three games from New York. That 7th inning featured three errors and two wild pitches by the Yankees. Albert Pujols delivered a run-scoring single that gave the Angels the lead for good, scoring Cameron Maybin. Maybin also lead off the game with a home run against Luis Severino, who took the loss and fell to 5-3 on the season. Maybin stole his AL-high 22nd base, and scored three times. He has safely reached in a career-high 26 straight games. Yusmeiro Petit (2-0) threw two perfect innings in relief of starter Jesse Chavez to get the win. 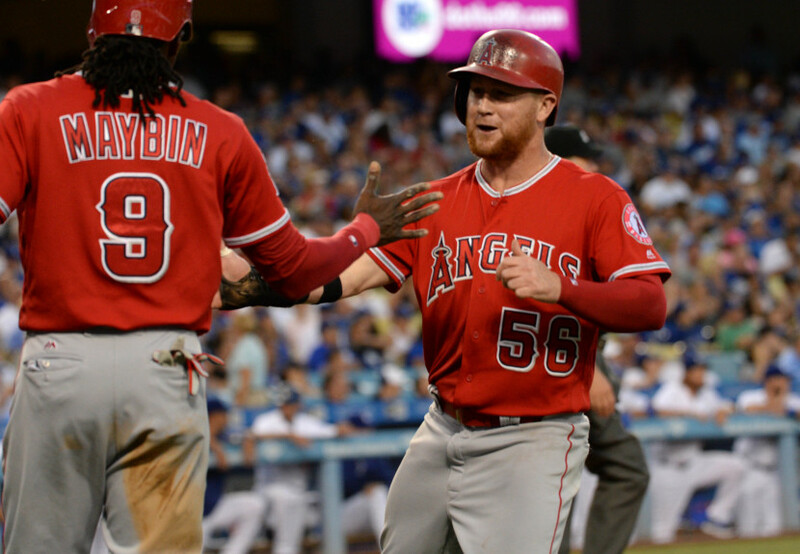 The Angels trailed 5-1 before scoring nine unanswered runs. Aaron Judge connected on a three-run homer that was his major league-leading 25th home run of the season. The Angels are back at .500 with a record of 38-38. They are 1.5 games out of the 2nd and final AL Wild Card spot. Alex Meyer (3-3, 3.52 ERA) will get the start on Friday as the Angels open up a 3-game series with the Red Sox at Fenway Park. Rick Porcello (3-9, 5.05 ERA) gets the ball for the Sox. This entry was posted in Angels on June 22, 2017 by omzzzzz. Didi Gregorius and Matt Holiday each hit home runs, as the Yankees beat the Angels 8-4 on Wednesday night in Yankee Stadium. The Yankees snapped a 7-game losing skid. Angel starter Ricky Nolasco was roughed up again, falling to 2-9 on the season. Nolasco went 5 1/3 innings, giving up five runs on seven hits, including two home runs. After the Angels fell behind 2-0, Martin Maldonado tied the game with a 2-run shot in the 2nd inning, with Andrelton Simmons aboard. That came off of Yankee starter Jordan Montgomery. Montgomery improved to 5-4 on the season, giving up two runs on five hits in 5 2/3 innings. Maldonado tacked on another meaningless two-run homer in the 9th inning, pulling the Halos within 8-4, but that’s as close as they would come. After Holiday’s home run gave the Yankees a 3-2 lead, New York would add two more runs in the sixth, and two more in the 7th to put the game out of reach. Angels reliever Mike Morin came out of the bullpen to pitch 1 2/3 innings. He gave up three runs on five hits during that stretch. The Angels and Yankees will do it again on Thursday, in the rubber game of the three-game set. Jesse Chavez (5-7, 4.85 ERA) is on the hill for the Halos. Luis Severino (5-2, 2.99 ERA) goes for New York. This entry was posted in Angels on June 21, 2017 by omzzzzz.